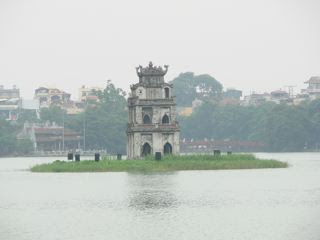 Black Travels community member, Claire Garcia is currently traveling through China and Vietnam, and has been sending us dispatches along the way. Our boat was a traditional 19th century junk, a replica of a pirate ship cleverly designed to look like a small commercial boat. I will send a photo in a separate e-mail. 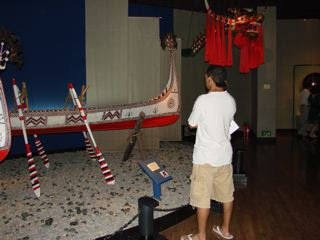 It had three feather-shaped sails and was made completely of wood~ even the sail mechanisms. 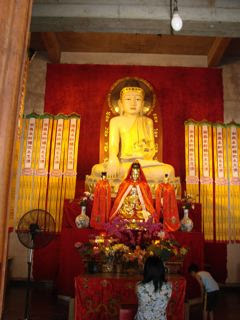 There were 8 passengers (two couples of the Hong Kong variety of gilded youth, and a loud and enthusiastic Australian couple, in addition to Mateo and me), our guide and translator, and a crew of about half a dozen, in gold-braided brown uniforms and bare feet. Ha Long Bay gets its name from a legend that a magic dragon spewed up a belly of jewels (the thousands of abrupt, weirdly shaped islands in the bay) to stop the ever-land-grabbing Chinese from making another assault on Vietnamese territory. As of a few years ago, it is now illegal to go on to most of these islands, as they are environmentally protected. But even in COnrad's time, landing on most of them would have been impossible, as they are sheer mountains and cliffs rising up directly from the sea. 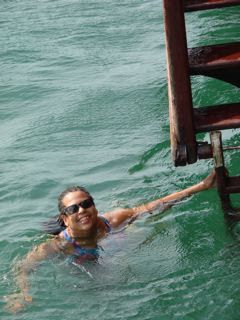 The sea itself is so placid that our guide says that it is referred to as "the world's largest swimming pool." "To the left a group of barren islets, suggesting ruins of stone walls, towers, and blockhouses, had its foundations set in a blue sea that itself looked solid, so still and stable did it lie below my feet; even the track of light from the westering, sun shone smoothly, without that animated glitter which tells of an imperceptible ripple." "On my right hand there were lines of fishing stakes resembling a mysterious system of half-submerged bamboo fences, incomprehensible in its division of the domain of tropical fishes, and crazy of aspect as if abandoned for ever by some nomad tribe of fishermen now gone to the other end of the ocean; for there was no sign of human habitation as far as the eye could reach. And when I turned my head to take a parting glance at the tug which had just left us anchored outside the bar, I saw the straight line of the flat shore joined to the stable sea, edge to edge, with a perfect and unmarked closeness, in one leveled floor half brown, half blue under the enormous dome of the sky." However, we at the dawn of the following century, on our replica tourist ship, put up for the night in a cove where a water village of houseboaters live as they have done for generations, fishing and not going to school. Their voices and music came to us across the dark water as we sat on the deck in the evening, and finally the captain moved our ship a little farther off, as there was a very agitated baby who was ruining the atmosphere for the westerners. Most of our hours on the first day were spent eating wonderful fresh seafood dishes and swimming off of the side of the boat. The young men went off in sea kayaks (and of course, as young men do, went farther than they intended, so a search party was sent out just before dusk. As the sun slipped below the horizon and the beautiful golden 3/4 moon became more prominent, I tried to quell my anxiety about three young men with no map, no guide, in a sea of a thousand unlandable islands. I later told Mateo, who has also read the Secret Sharer, that I thought he, as the Sharer does at the end of the novel, had disappeared toward one of the many "towering black mass[es] like the very gateway of Erebus" -- and become "a free man, a proud swimmer striking out for a new destiny" in the South China Sea. But they did all return safe and sound. While Mateo and Hong Kong princes kayaked, I went with the guide for a closer look at the water villages. The next day, we heaved ho (is that the past tense of this expression) and sailed to one of the many spectacular caves that have formed around the bay. 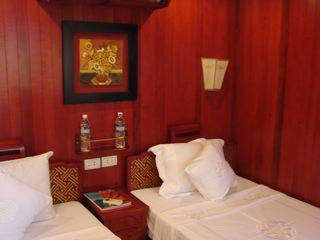 And, after more hours of fresh fruit (I kept trying to identify breadfruit, which figures large in the nautical tales of the South Pacific that I read, but that I have never seen or tasted) and fresh fish and swimming, we returned to port, and the harrowing ride back to Ha Noi. My children have often told me that things that I see always remind me of books. Well, Ha Long Bay reminded me of my second-favorite novel in the world, Joseph Conrad's The Secret Sharer. As I leaned on the rail of our classic junk (such a precise replica of the traditional boat that all the various mechanisms that would now be made out of iron or steel were wood), gazing out over the placid seascape of still water and jutting islands, lines of Conrad's kept coming back to me during our 2 days and a night at sea. For Conrad, this northern part of the South China sea was part of the Gulf of Siam; to the French colonists and later the American military forces, it was the Gulf of Tonkin. 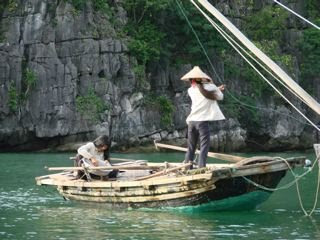 Now, to the recently (in their long history) unified nation of Viet Nam, it is Ha Long "Descending Dragon") Bay. Of course, it is routine to see families, including infants, who would have taken up a whole minivan on one scooter, and mountains of various produce. We also passed several Vietnamese houses, most of which were extremely narrow (one room wide), three or four stories high, with wide verandahs on each story, with elaborate pagoda style roofs. They are usually colored in "bright pastels"-- a term I would have considered an oxymoron before seeing the yellows, blues, pinks, and greens of the houses in the towns along the highway. 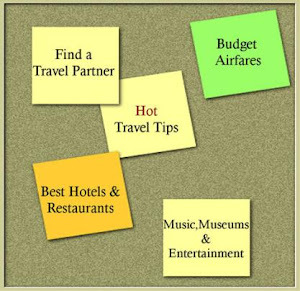 The hotel was in the Old City, but don't think that that moniker connotes some carefully tended quaintness and charm aimed at tourists. The Old City, like all the rest of Ha Noi that we have seen, feels like an old village~ uneven and cracked cobblestones, very narrow and tall buildings with shops and workshops (motor scooter repair, locksmiths, hodgepodges of plasticware, some stores selling "designer" clothing-- made in Vietnam-- such as the $3 Gucci swimtrunks we bought for Mateo), and the sidewalks teeming with life and work, most of it performed by people squatting. all looks and smells, I don't dare try to eat at these curbside restaurants. Adding to the village atmosphere are the women, many of them in the iconic conical straw hats, who move through the crowds with the double basket carriers slung over their shoulders. They all seem very small, and many are very old, but they carry all sorts of things, including live animals, in the baskets. Other women carry huge piles of things on their heads, like African women. There's a constant tinge of motor scooter fuel in the air, mixed with the aroma of street cooking, cinnamon (sp), incense burning at sidewalk shrines. . . .
Locksmiths working out of little boxes on the sidewalk~ young men spraypainting motor scooter parts on the sidewalk~ old men crouched over beers on the little plastic seats~ the narrow shops opening straight on to the sidewalk (traditional Vietnamese architecture seems tall ~ 3-6 stories~ and one room wide)~ the absence of skyscrapers, the old and heavy-leafed trees, the broad avenues and former colonial buildings~ all contribute to the sense that this is a unique place~ not just another itiration of a major, post-modern city. I didn't realize that Vietnam is one of the poorest countries in the world, with a national per capita income of $500 ($1000 in Ha Noi), but a long and rich history. Today Mateo and I spent the morning in the Vietnam Fine Arts Museum, which had exhibits that traced Vietnamese creativity from 2500 BC, through various dynasties, through modernism, the revolution, and ethnic and contemporary art. On our first day, we visited the Vietnam Military History Museum, which gave fascinating insight into Vietnam's war-torn history. It's clear that their struggle against the Americans was only one relatively brief chapter in struggles with China, France, and among themselves. The courtyard exhibited, disturbingly, wreckage of fighter planes which Vietnamese had shot down (several brought down by women), as well as a statement about the suffering-- through napalm, dioxin, and carpet-bombing- that Americans had inflicted on Vietnamese non-combattants. deal with Vietnamese political prisoners from the start of the 20th century. Again, the curation was straightforward and respectful of both the suffering and causes of all those who had been imprisoned there, including John McCain. 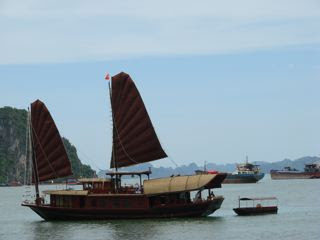 We needed a break from cities, document anxieites, and the weight of history, so spent two days on a classic wooden junk in Ha Long Bay. Somehow, "Shanghai" seems to warrant an exclamation point. It is city life on a mega scale. The "American Century" is definitely over~ this is what the future looks like. This country is producing the only thing that keeps a drowsy American emperor awake: cheap goods. I have never seen so many super-skyscrapers (even the apartment buildings). 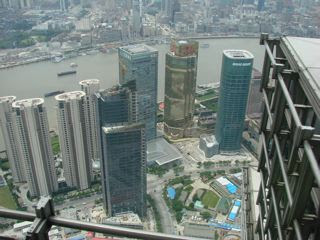 The streets are always teeming (Shanghai's population is 14 million) with humanity, buses, cars, bicycles. Never have I seen so many "gimungus" electronic billboards, or every single space devoted to advertising or selling. Never have I seen so many huge loads on bikes or motor scooters, or people splayed out in the street taking an afternoon nap. Every block has at least one major construction project on it. It is sweltering here. I'm not a big sweater, but I have ended every day drenched. 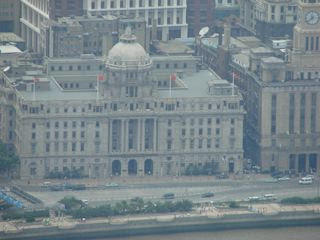 Of course, the first thing I did was stroll along the famous Bund, lined by European architectural imperialism: the street, the commercial center of old Shanghai (Customs house, the Hong Kong and Shanghai Bank - now the ubiquitous HSBC, etc)~ even a replica of Big Ben reminding the thousands in the street below 4 times an hour that the sun once never set on England. The HBSC has an astonishing domed mosaic in its lobby (it is still a working bank, amid all the glorious British neo-classical architecture) depicting the cities of its major branches: Calcutta, Hong King, New York, Paris, London, Shanghai, and one I'm forgetting. Unfortunately, photographs are not allowed. Opposite the Bund is the very proletarian riverside promenade park, where once "Chinese and dogs were not allowed," though these two prohibitions appeared separately in the municipal code, not on a sign at the entrance, as legend has it. The Bund is just over the creek from our hotel, the funky historic Astor House which is trying to make the transition from a backpackers' hotel to 3-star tourist hotel, accompanied by often-comical ESL and bellboys in plaid a-line skirts which management apparently mistook for kilts. Drenched, I found a secret little cafe tucked up in the rear of the second floor, guzzled one San Pelligrino in one gulp then tried to savor the second bottle while enjoying the coolness and the silence emanating from the courtyard below. 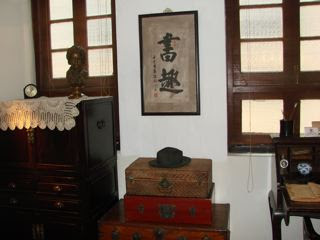 The next day, while waiting for my son Mateo to arrive, I headed over to the former French Concession to find the house, now museum, where the first Chinese Communist Party meeting was held. Of course, I first had to do the inaugural Garcia longer-than-it-looked-on-the=map-there-must-be-a-metro-around-the-next-corner death march for almost 90 minutes before finally jumping into a cab (cabs are cheap and plentiful). At the site, I was the only foreigner in a sea of Chinese tourists, including masses of shrieking school kids wearing red neck kerchiefs. It was very interesting, and included a wax figure display of the 13 youths, including Mao, gathering excitedly around a table, setting out the vision and goals of the CPC. Fleeing the secret police who were trying to track them down, the revolutionaries held the final stage of their initial meeting on a junk in the river. The museum also played homage to the "bourgeois revolutionaries," of the 19th and early 20th centuries who hadn't been able to succeed in over-throwing the imperialist oppressors because they didn't have the power of the proletariat behind them. My next stop was a wonderful museum in a crown jewel urban renewal project, the Sichumen Open House. Many of you know of my interest in town houses. 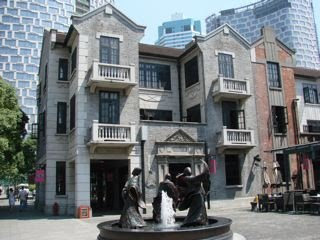 This museum reproduced a typical bourgeois town home, or sichumen, in 1920s Shanghai. It was an intriguing insight into how ordinary people lived and worked in pre-liberation Shanghai. My son Teo arrived from Beijing on the bullet train on Saturday night. Yes, he speaks Chinese: enough not only to navigate this amazing, overwhelming, and often wild city but also to joke with people and give directions to (Chinese) people who ask him. He is very disciplined and focused about learning Chinese~ does set lessons everyday on his mp3 player, though he mentioned this afternoon that he is "behind." He has been to Shanghai a couple of times before, and I'd be literally lost without him.